Perhaps the rarest and highest rated brand in the world, the OpusX has a world-renowned reputation for quality and class. It is full bodied with a rich and robust flavor. The Fuente OpusX is one of the rarest cigars in the world. It is elusive to almost every smoker because of its limited production. Prior to 1990 the Dominican Republic was well known for its filler and binder tobacco. Growing wrapper tobacco on the island proved impossible due to the topography of the land and the wind. The wrapper is a vital component of any cigar as it contributes to most of the flavor. Carlos Fuente Jr. set out on a mission to be the first cigar maker in the Dominican Republic to successfully grow wrapper tobacco. With the help of cheesecloths to protect the tobacco from the elements, the first successful crop was turned out in 1992. This wrapper is matched with unparalleled vintage tobaccos for its filler and binder and was the first Dominican puro (all Dominican cigar) on the market. The OpusX was an overnight success. It consistently receives the highest ratings from industry publications and continues to be the pinnacle of fine cigars. Almost impossible to find, this cigar is widely considered the “best of the best”. It is full-bodied and the aromas in each size are distinctly different, but the one thing each has in common is the near perfect taste and quality. Nowhere in the world can a finer cigar be found. This cigar is referred to by aficionados as “an expensive addiction” because once this cigar makes its way into your humidor, you will never look at cigars the same way again. 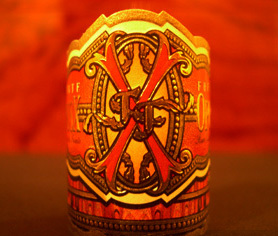 This extremely limited edition charity "two-pack" pairs Fuente's legendary Opus X cigar with its full-bodied, though less spicy sister cigar, the Diamond Crown Maximus. The shape and size of these cigars is unique to this charity pack, which comes in an attractive wooden "coffin box"; they cannot be purchased any other way. All proceeds go to Fuente's Cigar Family Charitable Foundation. Quantities are limited.